You've seen them: tiny, quick creatures that scurry through your cat's fur, feasting on her blood, and causing painful itching. If you've spotted fleas, keep calm: cat flea control is not only possible, it's relatively easy. How Can I Tell If My Cat Has Fleas? The most common flea that feeds off cats, dogs, and humans is the Ctenocephalides felis. If you observe your cat scratching and aren't sure if fleas are the cause, use a flea comb on your cat and observe the tiny black dots that emerge on the comb. These are commonly called "flea dirt," but in reality, it is the excrement the flea leaves. Smash some with a damp paper towel, and the flea dirt will turn red. The red color is residue from your cat's blood and a warning that cat flea control is indicated. 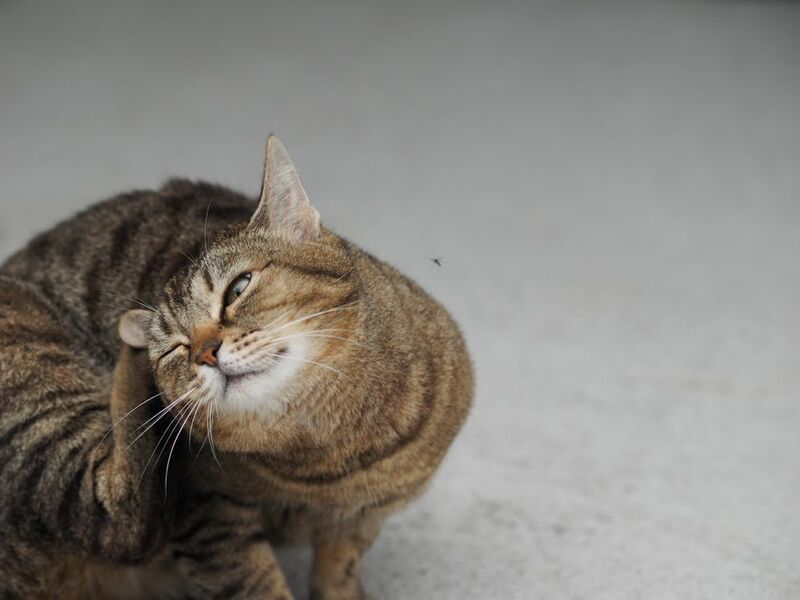 As if the itching and stinging weren't enough, fleas also transmit other conditions which can have a more deleterious effect on your cat's health. Anemia: Unchecked infestations of fleas can actually cause anemia from blood loss; this can sometimes be fatal, particularly in kittens. Pale gums are a red flag for anemia in kittens, and their gums should be routinely checked if your kittens have just survived a flea attack. Tapeworms: With kittens, fleas and worms are practically synonymous, and kittens that are victimized by fleas should always be treated for worms. Haemobartonellosis: A more serious form of anemia, caused by a microorganism carried by the flea, the h. felis in the case of felines. Haemobartonellosis is diagnosed by laboratory tests and treated with antibiotics, steroids, and in some severe cases, blood transfusions. The cycles of a flea are very like that of a butterfly, but unlike the beautiful end result of those flower-friendly creatures, the adult flea is a menace to all it encounters. Eggs: Fleas lay their eggs on the host animal, where the entire cycle may take place. Other eggs fall off into the environment, including onto your carpeting, your pet's bedding, or your own bed. Larvae: The larvae "hatchlings" feed on the feces left by the adult, and continue to develop for about a week. Pupae: Like the butterfly, the larvae will spin a cocoon for itself, where it continues to evolve into the adult flea. Adult: The emerging adult feeds on its host, mates, and continues the life cycle. Is it any wonder why cat flea control is so important? Your first job will be to eliminate as many fleas from your cat by combing and bathing. Once the bulk of the tiny nuisances are gone, you can prevent further flea infestations with the use of a topical flea control product. Bathe the Cat: If you and your cat are up to it, a bath will drown most remaining fleas. It isn't necessary to use a "flea" shampoo or a "flea dip" for this purpose. Just a mild cat or baby shampoo will do the job handsomely. There are several topical cat flea control products that work by affecting the nerve receptors of the flea. They are usually applied to the cat's skin at the back of the neck and are collected in the hair follicles, from which the product is slowly released. Most topicals are labeled for once-a-month application, although in practice, they may work much longer. It's very important to avoid using products labeled for dogs on cats: dogs and cats have different physiologies and are very different in size. If possible, avoid flea dips, sprays, powders, or collars. If you choose to use such products, do your homework and be absolutely sure that the ingredients used are safe for cats. Ideally, the best route is to choose one of these topical products, following the directions for your age/size of the cat. Advantage: Uses imidacloprid as the active ingredient, and is generally regarded as safe for cats and kittens over six weeks of age. Does not kill ticks. We personally use this product and have not seen a flea in our house for several years. Frontline: Said to kill both fleas and ticks; Frontline uses a synthetic ingredient called fipronil, which may cause a temporary sensitivity in the area of application. Revolution: Its main ingredient is Selamectin, which is said to kill not only fleas and some ticks, but also ear mites, as well as offering protection against heartworm. Revolution stays in the bloodstream, and should not be used on kittens under 6 weeks of age. Since it is a systemic product, it may cause allergic reactions in some cats. Next, you'll remove fleas and their eggs from your home. This should be an ongoing program while the adult flea treatment is killing the live fleas. Wash all bedding thoroughly. While the bedding is free of coverings, vacuum the mattress, particularly in the crevices, where eggs might hide. Vacuum carpeting daily and dispose of used vacuum bags. Do not place flea collars in the vacuum bag, as the heat generated by the machine could cause noxious fumes. Steam-clean carpeting. This will kill any remaining eggs the vacuum might have missed. If necessary, use a whole-house insect bomb which specifically targets fleas. It is critical to remove all food dishes and live animals, including birds, during this process. You may consider hiring a professional for this job, but make sure he knows you have cats, and will use a cat-safe product. Hire a professional to treat outdoor areas. Insist on a "cat-friendly" product for this purpose. If you have an outdoor cat, keep him confined inside for the day. If you follow this cat flea control program scrupulously, fleas will soon be a distant memory in your household, and your kitties will be eternally grateful to you for freeing them from unwanted fleas and the problems they bring.